← Whole grains and fiber: Unraveling the puzzle! Clockwise from top left: whole math, (featured in this recipe), whole mung and whole masoor beans. 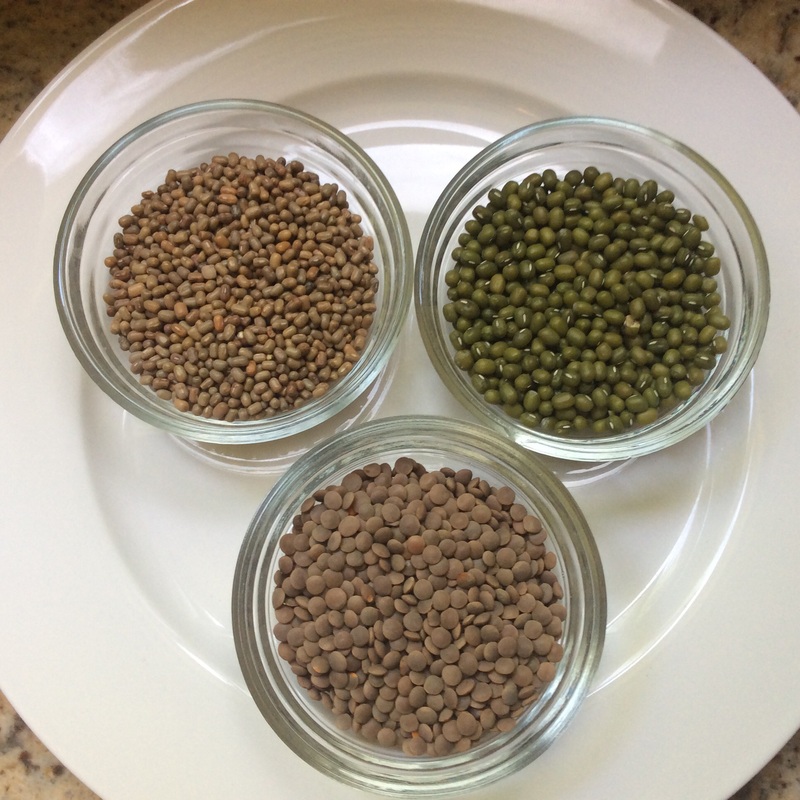 1 cup lentils, unsprouted (may use the flat, tan colored ones, mung beans or whole math beans, featured). Please refer to my post, “Complete meal on a plate” for instructions on sprouting lentils. 1 cup of math or mung beans soaked a day earlier, will yield approximately 3 cups of sprouted beans. In a 3 quart nonstick, or thick bottomed sauce pan, heat oil on medium heat. Add mustard seeds, stir for a few seconds until mustard seeds begin to sizzle. Add chopped onions and sauté, until transparent, about 5-7 minutes. Add fresh chopped tomatoes, sauté until tomatoes wilt and soften, and the mixture forms a homogenous mass, about 4-5 minutes. Add all spices to the pan, stirring well. Add sprouted lentils, stirring well into above mixture. Add approximately 3 and ½ cups boiling water or vegetable stock to lentil-onion mixture and bring to a rolling boil for about 4-5 minutes. Cover tightly and allow to simmer on low heat until lentils are cooked, tender to the touch and have absorbed most of the cooking liquid. You may add more liquid if desired for a soup like consistency, but for the pita recipe here, you would want lentils that are somewhat moist, but not floating in liquid. Stir salt to taste into lentils, along with the remaining tbsp of coriander leaves and set aside. 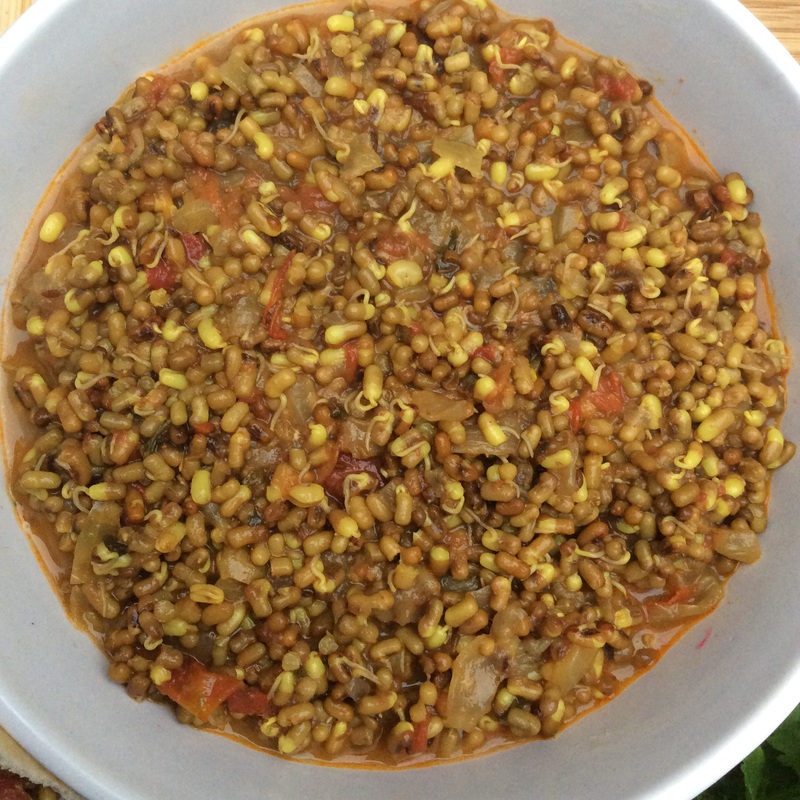 This recipe yields approximately 3 cups of cooked sprouted lentils. Spoon ¼ cup of fresh salsa over the lentils in the pita pocket. Top with a small amount of avocado, grated cheese and cilantro for the garnish. Repeat this process for all the pita pockets. The recipe yields 9 pita pocket halves. Serve immediately as pita pockets are likely to get soggy if not. A Registered Dietitian’s tip: This is pretty much a complete meal in a pocket. 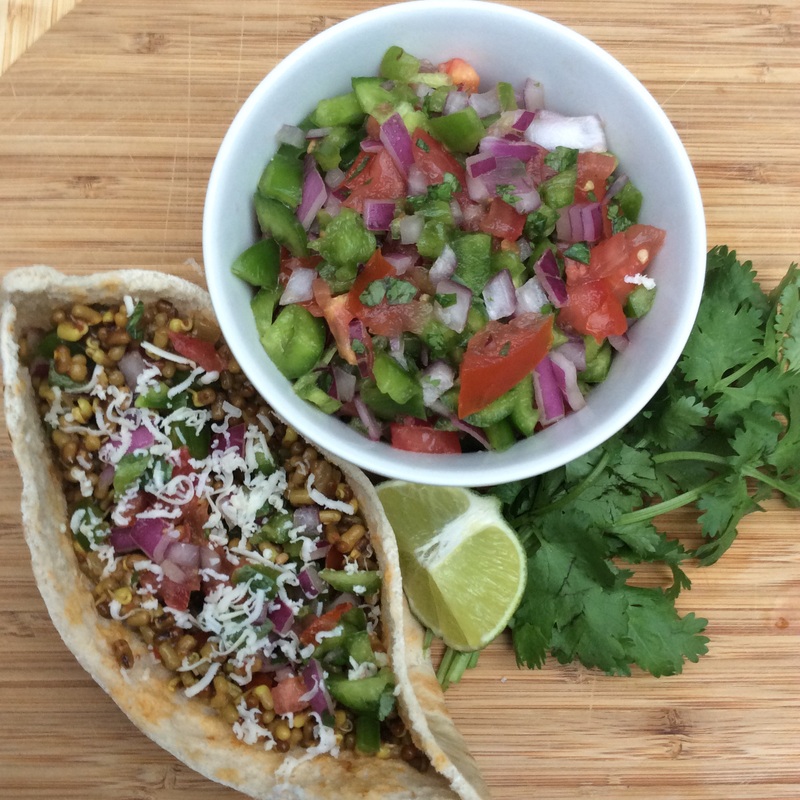 The pita pocket serves as a high fiber whole grain, lentils provide tons of protein, the peanut oil and avocados supply healthful, unsaturated fats and the vegetables provide a plethora of antioxidants, vitamins and minerals. 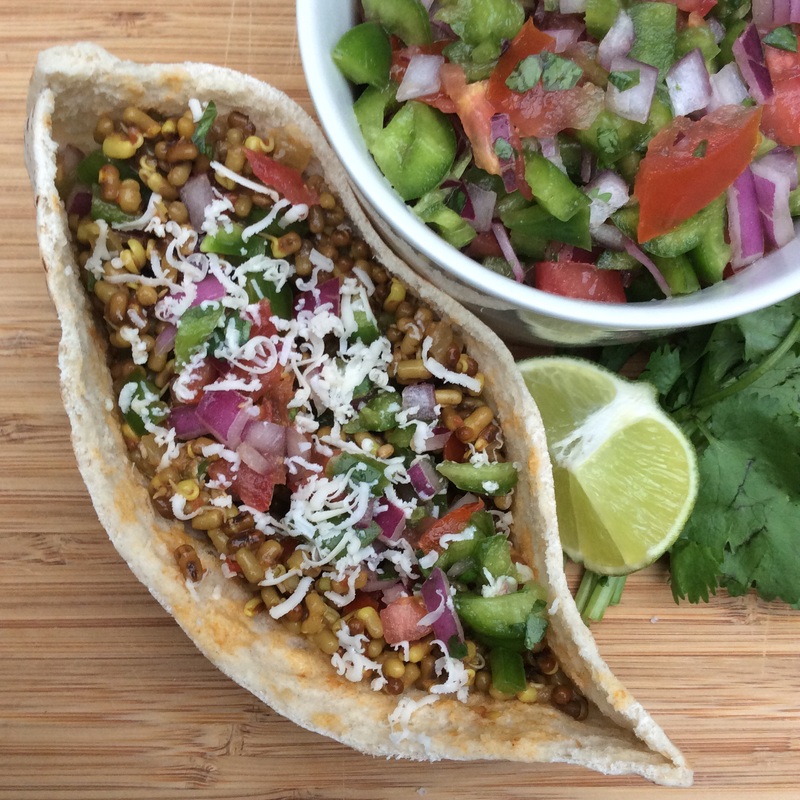 In addition, sprouted lentils pack the nutrient power of a germinating seed! All for well under 200 calories per serving and 7 hefty grams of fiber! Pair with a yogurt or a bowl of fresh fruit for a satisfying meal. So go ahead, dig in and indulge! Chef’s tip: Allow 48 hours for lentils to sprout in dry, cool weather and about 24 hors when humid and warm. Make sure that lentils are on the drier side when stuffing the pita pocket as it is likely to get soggy and fall apart. Nutrient analysis source: myfitnesspal.com. Myfitnesspal.com is an independent website that is not in any way affiliated with this blog. 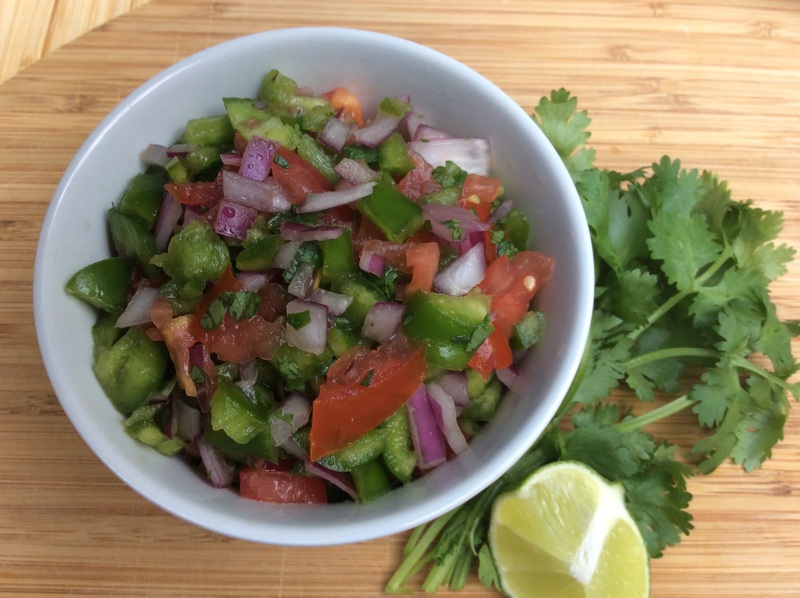 This entry was posted in Get cooking, Main dishes and tagged Antioxidants, avocados, beans, carbohydrates, complete meal, fiber, healthy fats, lentils, pita, protein. Bookmark the permalink.